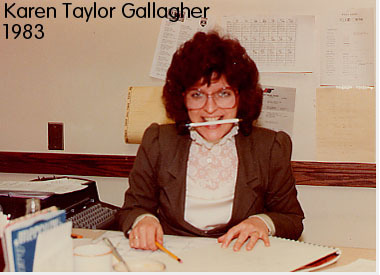 Karen "Taylor" Gallagher was our General Manager Bob Carolin's right-hand lady. Get this...get that...can you type this...don't put any calls through I'm going to be in a meeting. Call that record guy and tell him we're adding... this week. Could you keep an eye on the candy jar in my office and see who's eating all my stuff? There was no end to the work... and Karen always handled it with a smile and great aplomb.